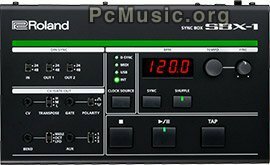 Roland announces the SBX-1 Sync Box, a universal synchronization hub for electronic musical instruments and computers. Equipped with USB-MIDI, standard MIDI, and DIN sync ports, the compact SBX‑1 provides a convenient way for music creators to use modern production tools and legacy analog devices together at one time. Going far beyond simple synchronization, the SBX-1 also provides hands-on control of timing and groove, and includes CV/Gate outputs for triggering old-school instruments such as the SH-101, TB-303, and TR-808.